India 03 September 2016: Pomegranates are one of the healthiest and tasty fruits on earth. Pomegranates is a fruit bearing deciduous shrub, small tree in the family Lythraceae that grows between 5 and 8 m (16 and 26 ft) tall. Pomegranate juice should not be taken by people suffering from influenza, cough, and constipation or for those with a phlegmatic condition. Pomegranate is a great source of ellagic acid, antioxidant, punicic acid, an omega 5 polyunsaturated fatty acid which is highly beneficial for cell regeneration and proliferation. Pomegranates juice this fruit is very good in the source of vitamin A, C and E and minerals such as calcium, phosphorous, potassium, iron, folic acid, niacin, thiamin, folates and riboflavin. The enzymes that pomegranate has can make difficult for the functioning of certain enzymes present in the liver. For Liver disorder If you are on medication you must speak to your doctor before eating this fruit or its juice. Pomegranate fights against diabetes, pomegranate is a preventive food. If people or individual suffering from diabetes must stay away from pomegranate because it has a high content of sugar. People who are are on a diet and are watching your calorie intake must ignore/ avoid for eating this fruit or its juice. Pomegranate adds up calories to the plate. Pomegranate juice can also cause weight gain. Eating lots of this fruit causes many disorders. Disorders are nausea, vomiting, abdominal pain and diarrhea. But these sign usually go after a few hours. Eating or consuming too much pomegranate can also irritate the gastrointestinal tract. To must take maximum benefits of this Fruit juice. For that you must drink freshly extracted pomegranate juice with no added sugar. You can drink 2 - 8 ounces of fresh pomegranate juice a day. 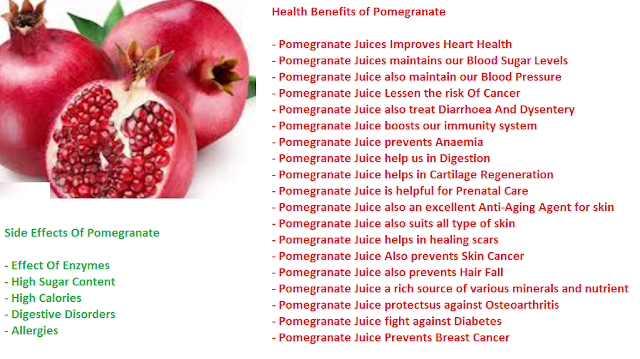 We all know the benefits and side effect of Pomegranate fruit you must stay smart and stay healthy. Comment below and tell us the experience of Pomegranate Fruit the healthiest fruit.